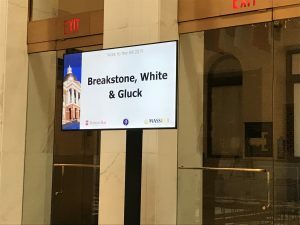 Breakstone, White & Gluck participated and supported the Equal Justice Coalition’s Walk to the Hill 2019 at the Massachusetts State House. Breakstone, White & Gluck was pleased to support and participate in the Equal Justice Coalition’s Walk to the Hill, seeking increased funding for civil legal aid in Massachusetts. Attorney David W. White joined hundreds of lawyers at the Massachusetts State House, urging legislators to help fund free legal services to residents who cannot afford an attorney on their own. Many Massachusetts residents are not familiar with the coalition until they need help with a landlord dispute, consumer fraud or another non-criminal matter. Then the coalition’s services become critical because when someone faces criminal charges, they have the right to an attorney. But those who need representation in a civil matter are on their own. If they can’t afford a lawyer, the person could suffer devastating losses, personally and financially. With more funding for civil legal aid, the coalition and other legal aid organizations can help more individuals and families stay on track, in their homes, working, receiving medical treatment or going to school without interruption. The Equal Justice Coalition was created in 1999 by the Boston Bar Association, the Massachusetts Bar Association and the Massachusetts Legal Assistance Corporation. Representatives from these programs participated in a speaking program in the Great Hall at the State House, before attorneys began visiting lawmakers’ offices. Speakers included Louis Tompros, chair of the Equal Justice Coalition; Lynne M. Parker, Executive Director of the Mass. Legal Assistance Corporation; Supreme Judicial Court Chief Justice Ralph Gants; Christopher Kenney, President of the Massachusetts Bar Association and Jacquelynne Bowman, Executive Director of the Greater Boston Legal Services.